The blackgaze inspired atmospheric black metal band Morild from Copenhagen blasted onto the scene in 2017 and I had my first experiences with them when they were featured as part of Blastbeast’s New Sh*t Showcase event in January 2018. They have a habit of performing with fluorescent colors splashed on their faces, embodying the meaning of their name that is the Danish word for the somewhat mysterious phenomenon of seawater apparently glowing due to bioluminescent bacteria. 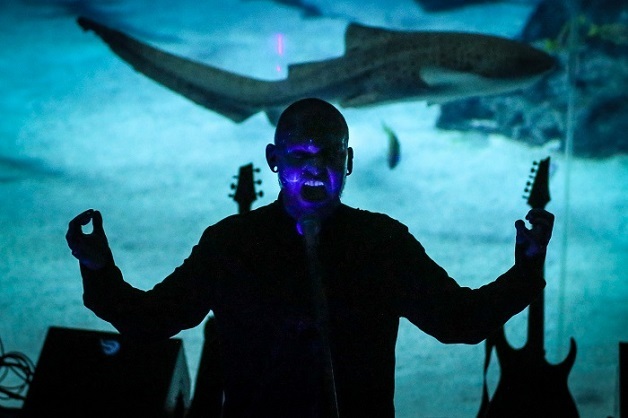 A metal scholar recently mused that they could be defined as ‘oceanic black metal’ and indeed their music has the huge, uplifting, and crushing qualities that one might associate with the power of the seas. 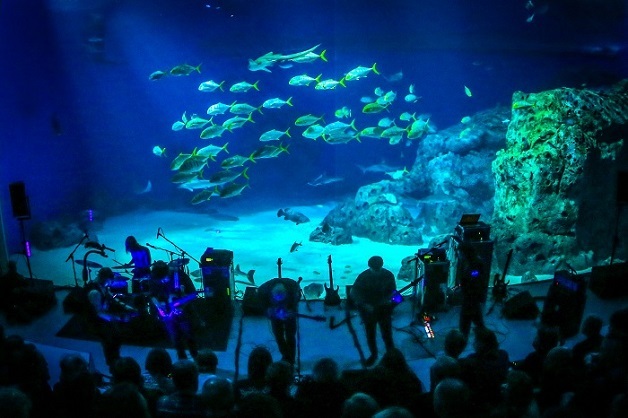 As such, it’s a stroke of genius for them to be performing the release show for their new full-length record at Denmark’s National Aquarium Den Blå Planet, in the ocean section, of course. The allure of the venue, as well as the excitement for the new music, had the event sold out quickly and indeed, the setting does not disappoint. It’s a classy place that allows the audience to stroll around parts of the aquarium, beer in hand, to look at fish while we wait for the band to begin. Strobes are off-limits tonight out of concern for the daily inhabitants and instead, everything is illuminated by the blue light from the aquarium’s biggest tank as well as cleverly installed lamps that make the ceiling shimmer as if we were submerged in the water along with various ocean fish, hammerhead sharks, rays, and one lonely sea turtle. The instruments are lined up in front of the tank right in front of an amphitheater-like setting of stairs to sit on. The audience today is thus divided in the ones that find a seated spot and others that prefer to stand around in a half-circle, leaning on the railing at the top. 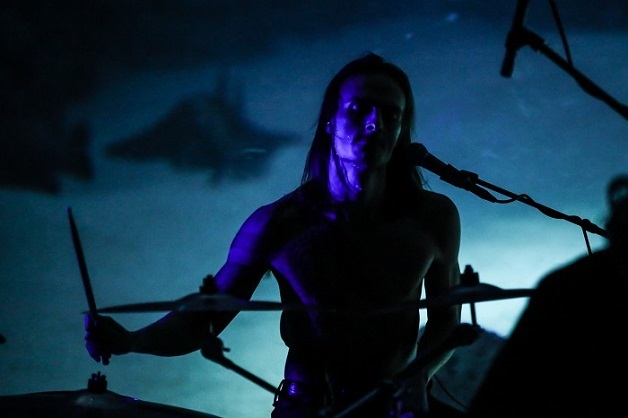 Leading up to the beginning of the concert, noisy droning sounds replace previous low-key music like Sigur Ros on the speakers, and the audience gathers from around the venue. 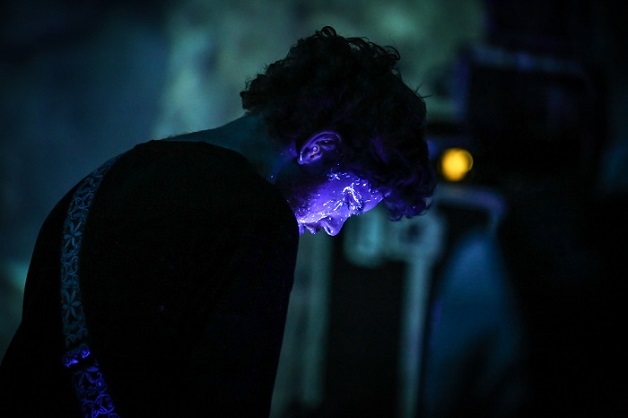 The band members take their place one by one, and as usual, they are accompanied by ultraviolet lights that reveal phosphorescent patterns on their skin as they move about the stage. 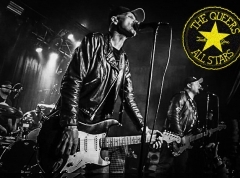 They soon dive into a full performance of their new album with the immense title “Så Kom Mørket Og Tog Mig På Ordet En Sort Sky Af Minder I Afgørende Stunder Frosset Fast Til Mit Indre Jeg Håber Det Forsvinder Med Lyset At Dø Eller Blive Fri”. This is made up of the titles of the six individual tracks on the record, and while each song stands as a movement on its own, most of them are played in continuous succession tonight. The drums begin with a slow, simple beat but as the bass and then the three guitars kick in, the immensity clearly proves why this music is well-suited for this kind of setting. They throw themselves into their music but the bassist is definitely the more active one of them, headbanging and pacing his side of the stage frequently while the rest of them remain more confined to their separate spots. While the band plays through their music with great energy, the sound is not always at its best though. I suppose this is to be expected from a place that is not made for these kinds of colossal walls of sound and unfortunately, it means that we get a very rumbling version of the album as the sound bounces around the funnel made by the glass walls of the tank and the stairs. We get a kind of more raw edition of many of the songs, as the echoing or distancing effects that for instance encompass the vocals on the album are not so prevalent here. Thus, the show makes up for the swings in sound quality with abundant atmosphere and emotional energy. Especially the raw black metal vocals have a huge impact as they draw us into the heavy, existential lyrics of the band’s songs. The more quiet parts of “En Sort Sky Af Minder” for instance really stand out in this regard and give even more weight to the music when the instruments come down on us again later. “Frosset Fast Til Mit Indre”, which is quickly becoming one of my favorite parts of the new album, provides us with a breathing room in its atmospheric middle with shimmering guitars but is also the song most heavily disturbed by sudden surges in feedback-like sound that visibly bother the band as well. These moments take us out of the immersive experience a little bit, sadly, but the band plays on as planned nonetheless. The band pauses towards the end of the set to thank us for coming out, before flooring us with the colossal effect of the album’s final track “At Dø Eller Blive Fri”. The audience has not been heard much through the show but at the end, they cheer and clap extensively, actually ending with a standing ovation while the bandmembers look up with satisfied smiles on their faces, having overcome the difficulties in sound and gear and succeeded in making a lasting impression on us. With fitting surroundings like this, the themes of the music take on even deeper meanings and they certainly help carry the heavy and emotional atmospheres through to us. As a full experience, the show definitely makes an impression and still, I would love to see the new songs fully come to their right production-wise in more regular concert surroundings as well. I can only imagine that the Danish metal audience will have several chances at that in the future, though, because this is no doubt a band that has the potential to go far.